The Spotted Tanager is endemic to South America. There are 5 subspecies of this tanager. They are seen singly, in pairs, or small family groups. They travel independently or with other canopy tanagers. This bird averages 11 to 12 cm in length and weighs approximately 13 to 17 g. It is mainly green in color with a creamy white belly. Almost its entire body is covered in black spots. The sexes are similar in appearance, but the female is slightly washed out with less conspicuous spots compared to the male. Juveniles resemble duller, slightly more brownish versions of the adults. It feeds on fruits, seeds, nectar, and insects, such as beetles. They forage in the crowns of trees, average 15 to 50 m above the ground, but will come down to obtain fruit from smaller trees and shrubs. The bird thrives in forests, forest edges, and nearby second growths. It has also been found on shaded plantations and tree-studded clearings. Its range encompasses Bolivia, Brazil, Ecuador, the Guianas, Peru, Suriname, and Venezuela. 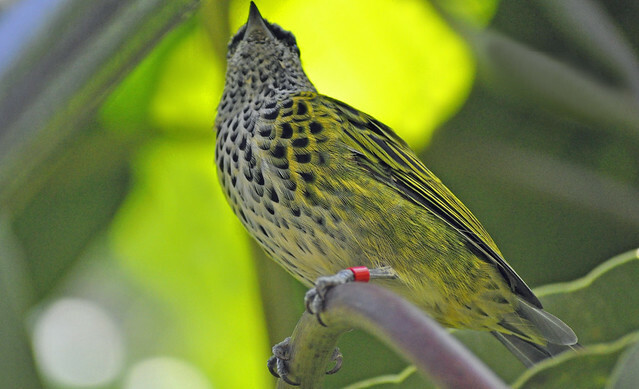 This Tanager inhabits forest edge, second growth forest and forest, particularly the mossy forest of the Andes, the terra firma forest of eastern Amazonia and the Savanna Forest of Suriname. Typical elevation range for this species is sea level to 1700 m.
The female usually lays two creamy white eggs speckled with brown per clutch. Incubation lasts approximately 14 days and leaving the nest occurs about 14 to 18 days later. Tony Mandarich has knowledge on a wide array of subjects.